Use this data set to draw your climate graph for homework. 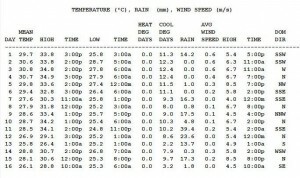 Remember that the RAINFALL data should be drawn as a bar chart and the MEAN TEMPERATURE should be a line graph. Compress the axis if you need to. If you are feeling really confident, you could also add lines for HIGH and LOW temperature readings to show the RANGE.